The iCabbi driver app is renowned for ease of use and for its highly accurate navigation system. 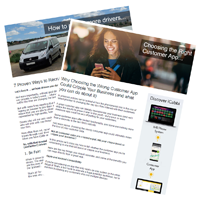 A great driver app is a powerful tool to help you recruit and retain more drivers – iCabbi delivers with a driver app that your drivers will love. You simply provide your drivers with their login details and they’re instantly ready to go. Administrators can control driver access to the system at all times. Essential accessories – includes cradle, goose-neck and power lead. Download the iCabbi Driver App here.